The ‘Stanley’ design by BlossomCo is a great lead and matching collar set to give as a gift for dogs. 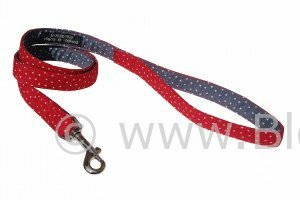 With its distinctive deep red fabric with white stars on the outside contrasted by the slate grey lining with with more stars, this is a lead and collar that is sure to stand out and attract envious glances towards your dog! Click here to see the matching collar!